SOUTH CHINA — Ally Turner scored 11 points and Gabrielle Wener had 10 points as the Messalonskee girls basketball team beat Erskine 51-32 in a Kennebec Valley Athletic Conference Class A game Tuesday night in South China. Bri Benecke added eight points for Messalonskee (4-2). Jordan Linscott led Erskine (1-5) with 10 points, while Joanna Linscott added nine points. RANGELEY 69, TEMPLE 32: Natasha Haley had 25 points and 10 rebounds to lead the undefeated Lakers (7-0) to the East/West Conference victory in Rangeley. Brooke Egan scored 15 points and Olivia Pye added 12 for Rangeley. Deleyni Carr scored 15 points to pace Temple (2-5). LEWISTON 51, MT. BLUE 41: Victoria Harris scored a game-high 22 points to lead the Blue Devils to the KVAC A win in Farmington. Lexi Mittlestadt equaled Harris’ output with 22 of her own for Mt. Blue (2-5). 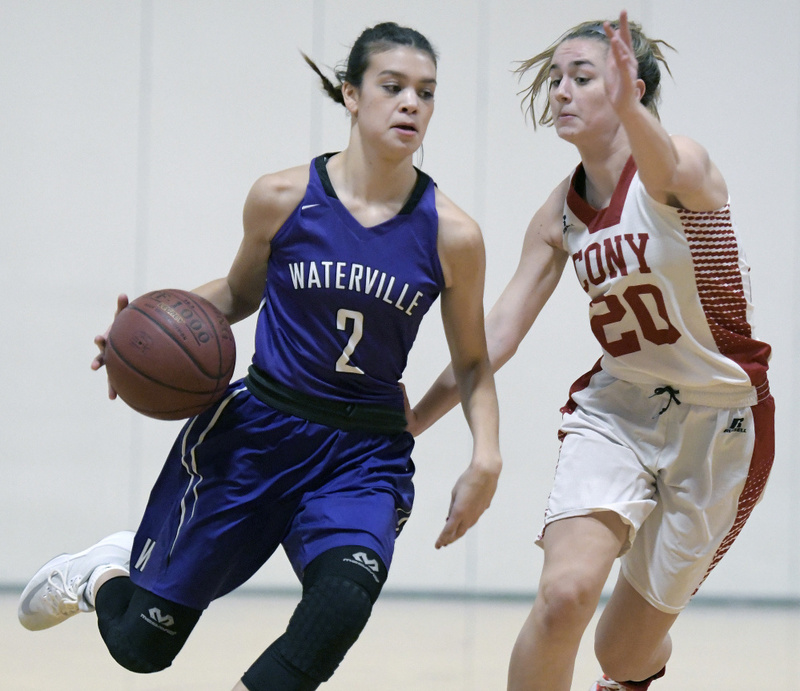 WATERVILLE 41, CONY 22: The Panthers broke open a close game in the second half, pulling away for the KVAC win in Augusta. Tied 8-8 at the half, Waterville (3-4) outscored the Rams (0-7) 33-14 in the second half. 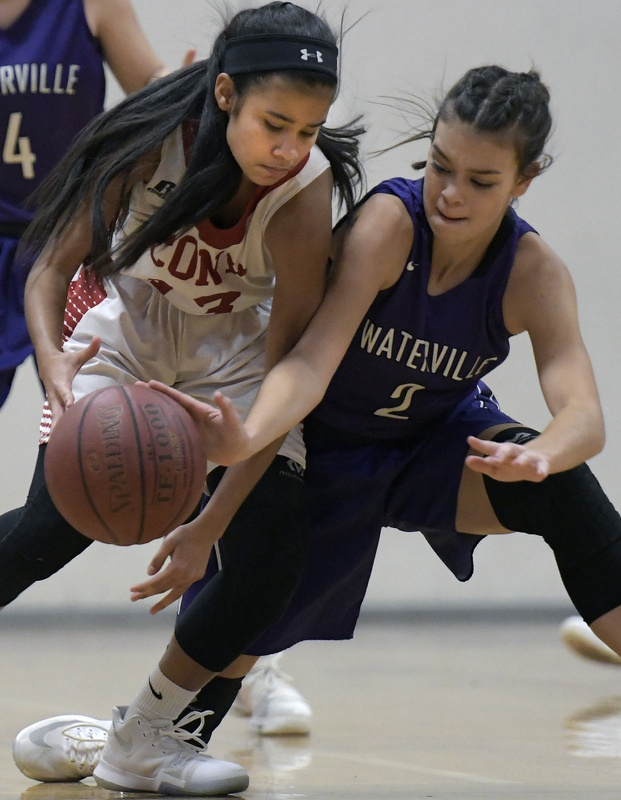 Jada Murray scored 11 points for Waterville, while Mackenzie St. Pierre added nine points and eight rebounds. GARDINER 45, MT. ARARAT 31: Leslie Stevens had 11 points, eight rebounds, five blocks and three steals to lead the Tigers to a KVAC A victory in Topsham. Aimee Adams had eight points and 14 rebounds for Gardiner (5-2). Mikayla Bourassa scored nine points and Jaycie Stevens chipped in with eight points for the Tigers. Sophomore Kyla Greenleaf led Mt. Ararat (0-6) with nine points. SKOWHEGAN 62, BREWER 39: Marcus Christopher earned a double-double with 20 points and 12 rebounds to lead the Indians to a KVAC A win in Skowhegan. Cole Pierce had 18 points, while Cam Barnes had 10 points and eight assists for Skowhegan (5-2). Kobe Rogerson and Nate Laskey each scored eight points for Brewer (3-4). GARDINER 91, MT. ARARAT 71: Connor McGuire scored a game-high 27 points and Ben Shaw added 12 as the Tigers rolled at the Augusta Civic Center. McGuire also had seven rebounds. Cole Lawrence chipped in with 10 points for Gardiner (4-3). Greg Malin led the Eagles (1-6) with 16 points. MADISON 69, WISCASSET 38: Sean Whalen scored 22 points as the Bulldogs cruised in Madison. Evan Bess scored 10 points for Madison (4-2), while Zach Belanger and Max Shibley each added eight points. Ronald Drake led Wiscasset (0-7) with 18 points. RANGELEY 57, TEMPLE 46: Kyle Larochelle scored a game-high 29 points and Will Brey added 11 as the Lakers prevailed in Rangeley. Cal Crosby scored nine points for Rangeley (4-3). Nikola Kekic scored 10 points for Temple (2-4). MARANACOOK 74, MCI 58: Silas Mohlar scored 18 points to lead the Black Bears to a victory over the Huskies in Readfield. Cash McClure and Bryan Riley each scored 10 points, while Mitch Root added nine points for Maranacook (5-1). Daniel Garamvolgyi and Jose Valverde each scored 16 points for MCI (3-3), while Owen Williams added 15 points. 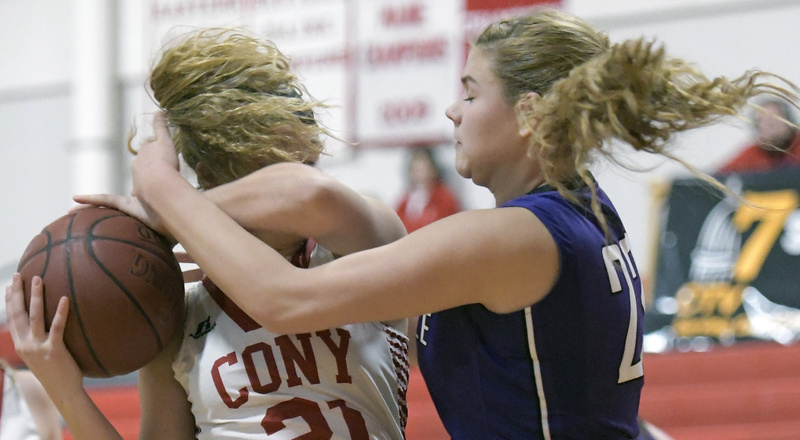 CONY 77, WATERVILLE 54: Jordan Stratton had 14 points and Ian Bowers scored five points and grabbed 15 rebounds as the Rams prevailed in Waterville. 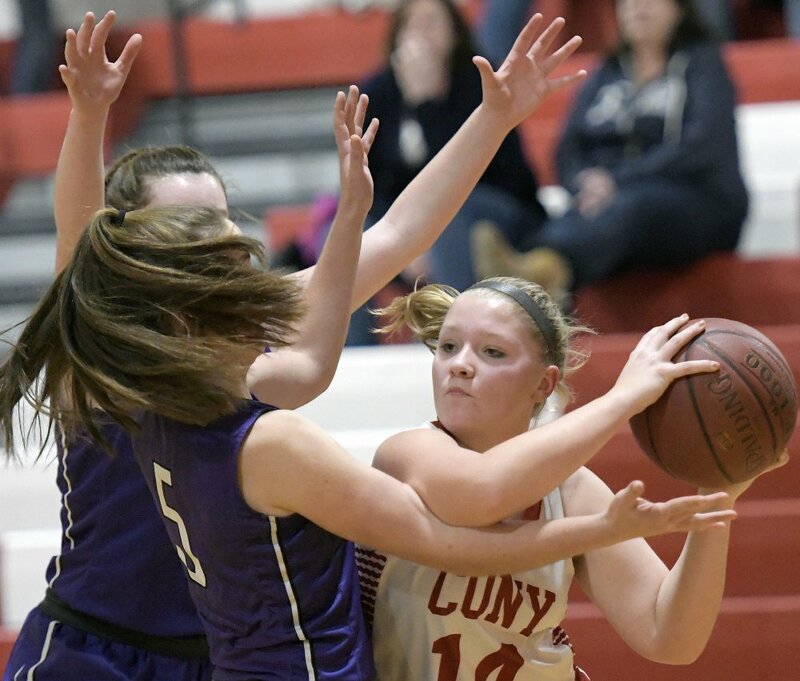 Jordan Roddy finished with 10 points for Cony (4-3). David Barre scored 22 for Waterville (0-7) in the loss. OCEANSIDE 59, WINSLOW 47: Mike Norton Jr. scored a game-high 21 points to lead the Mariners to the KVAC win in Rockland. Cooper Wirkala added 12 points for Oceanside. Mike Wildes led Winslow with 12 points. Colby Pomeroy and Spencer Gordon finished with 11 and nine, respectively, for Black Raiders.